Sorry about the delay, but I finally recovered from the trip: unpacking, catching up on sleep, sorting through photos, organizing purchases, putting away costumes, and dealing with life. Even this quick overview took some time (and yeah, it's BIG). All my real-time updates (more or less) took place at my Facebook page, and I plan on writing up some more detailed discussions later. Referred to as Line-Con, this is where you meet & chat with other geeks making temporary friendships. I'm seeing a lot of discussion about whether Comic-Con was smaller this year or had fewer vendors - especially the movie studios. I haven't seen any numbers that would support this, but if their were fewer movies, the studios had way more TV shows represented. My general impression is that the con itself was as big as last year and the year before. It's not getting any bigger, and it's certainly not getting any smaller. Because, you know, it's maxed out. The booths seemed as crowded and the lines into the panels seemed as long (but better controlled). The lines to get INTO Comic-Con (the big morning line) seemed longer than last year. You needed to get up even earlier than before, and when I left the con at night, the line (which already starts up for the next morning) seemed longer than I remember. And the lines for buying convention exclusives from the major vendors seemed to fill up sooner. A fairly quiet Sunday morning in the Gaslamp District. Normally this intersection is packed with people. Outside the convention center, it seemed as big as ever, although I've heard some reports that there were fewer buildings in the Gaslamp District taken over by vendors because the locals had jacked up prices. However, the number of off site events seemed more than last year. I got to very few, mainly because I had plenty to do on site. If I ever miss out on a full set of tickets (very likely because of the lottery system in place), there is plenty to do off site. Even though I don't attend movie panels, I'll agree with the statements that there didn't seem to be the same magic moments that occurred in past years, such as: Loki talking to the audience on stage in full armor, the entire cast of avengers with Joss Whedon, Batman v. Superman reveal, etc. 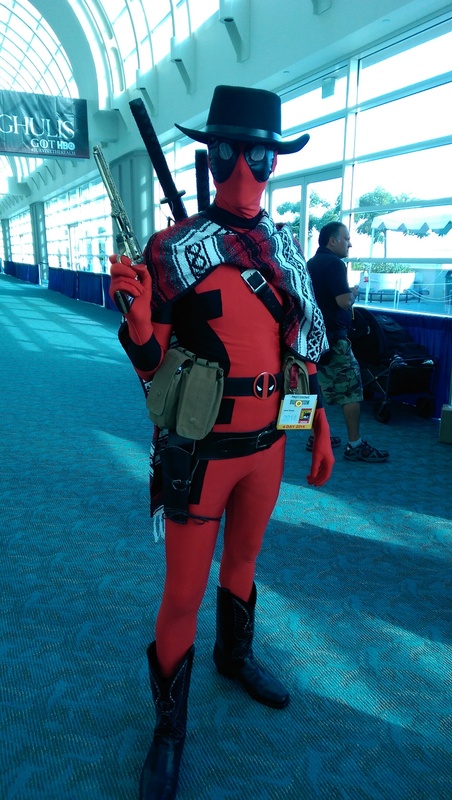 Our expectations are set very high at Comic-Con. 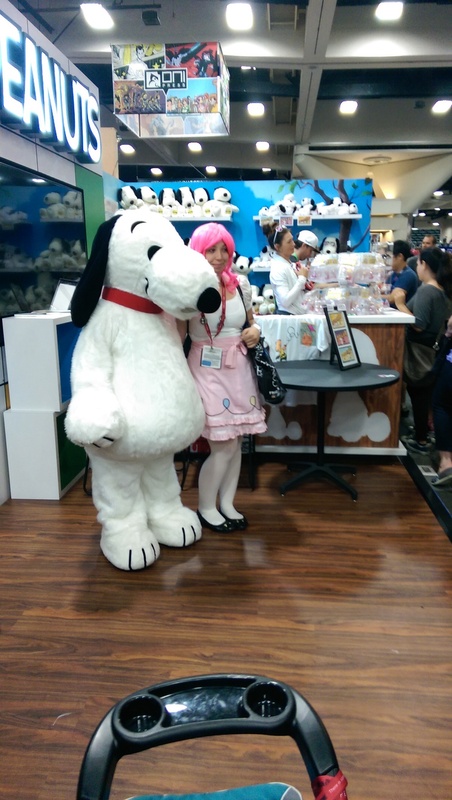 Comics are the heart of Comic-Con. Don't let anyone tell you otherwise. Every major publishing house, all the secondary publishers, and more indie and small publishers than you'll find anywhere else in the US. A third of the panels are about comics, the Eisner awards take place at Comic-Con, the Artists' Alley is amazing, and there are organized meet and greets between publishers and would be creators. Add to that all of the behind the scenes meetings between the creators, editors, and publishers discussing deals, projects, and future plans and you have the industry's main convention. I love talking with the publishers and creators. 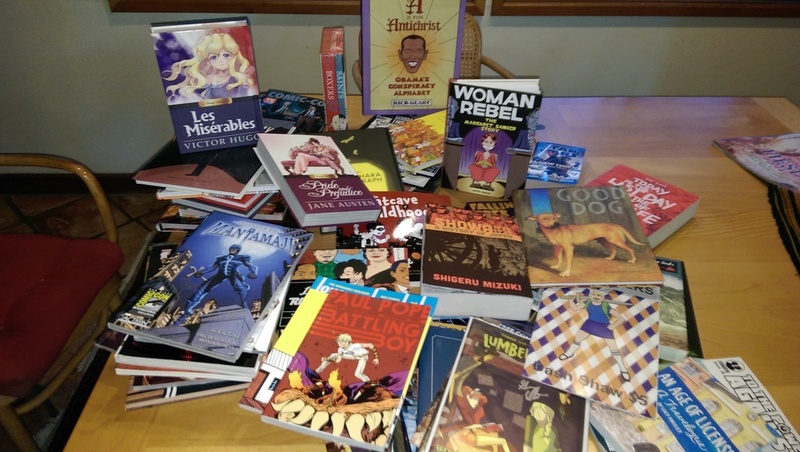 Most of what you see in the photo comes from small publishers that I got to sign their work. An amazing range of artists are in Artists' Alley and most are more than willing to chat about their work or just about any geeky topic. Prices are reasonable and many will still do free sketches. I've heard that there are other, better artist conventions, but I've always found Comic-Con to be a great time to interact with artists. The Eisner awards are to comic books what the Hugos are to science fiction. Or, for a less geeky reference, what the Oscars are to movies. Awards are given by a fairly prestigious set of presenters to creators who are dressed up and on good behavior. It's an interesting and surprisingly fun event, and the nomination list is a big part of my Comic-Con shopping list. Hare are the links for this year's nomination list and the list of winners. Okay, here's where I'm going to admit to an embarrassing moment. I brought two costumes with me, and I planned on wearing both. I was feeling pretty smug that I had new bags for both of them. 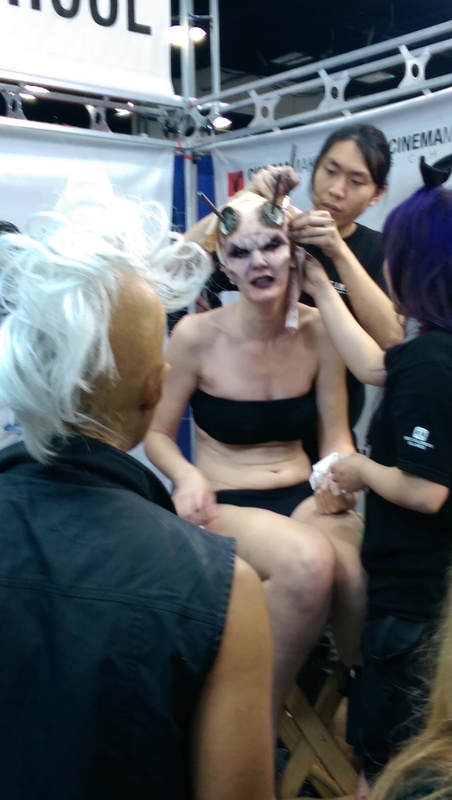 I had prepared makeup for the first time and was ready to wear it while playing Malgus. And then I discovered that I was missing several key parts of the Darth Malgus costume. I searched everywhere, and it became clear that I just hadn't transferred all the costume from the old bag to the new. So, no Malgus costume at this convention. Ouch, ouch ouch. The Deviant Art folks (who sponsor Artists' Alley), were excited to have me chop off the head of their mascot. Luckily the Headless Horseman costume was complete, so I spent extra time in that character (about 4 hours rather than my usual 2). I was completely wiped after such a long time in a difficult costume, but it was totally worth it. 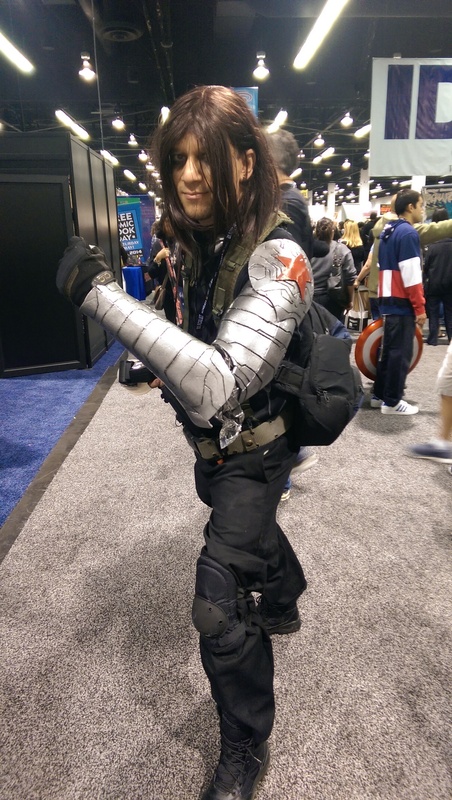 Of course, the cosplay that I saw was amazing. I've attached a gallery here, and of course, it's just the stuff that I saw and could get a picture of. 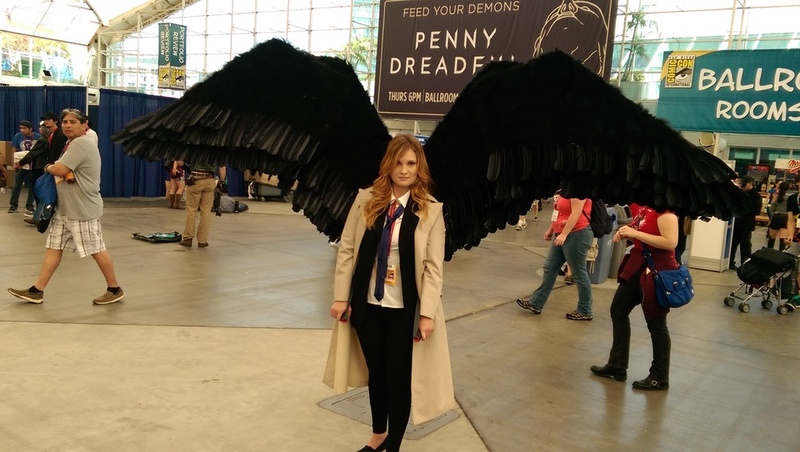 That's just a small fraction of the total number of amazing costumes and you can easily search for photo galleries, music videos, and YouTube summaries of a lot more cosplayers. 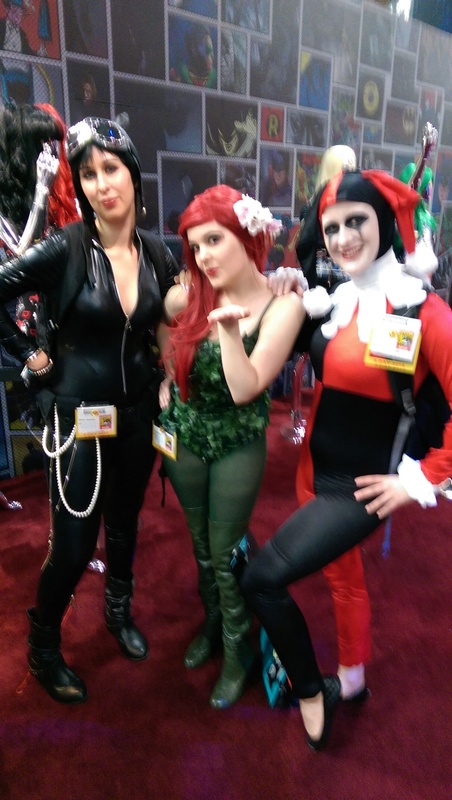 Each day I tried to get a rough count on the percentage of cosplayers, and I'll put all that into a separate post. I was also able to talk with some suppliers. I ended up buying my first wig that's intended for a new character (I've bought cheap wigs as improv props before). 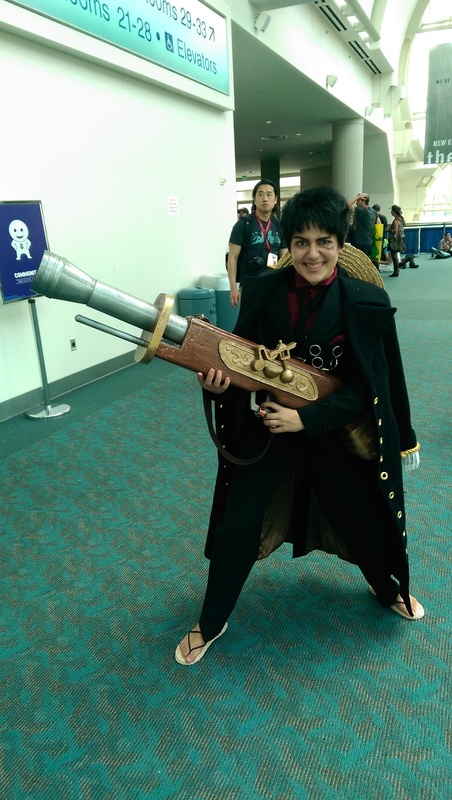 It was great directly talking with the guys in the Epic Cosplay booth (yeah, two guys), because they immediately looked up the character I was planning, found a wig that was close in color length and style, and talked with me about how to alter it. It was fantastic help. Once again, the advantage of going to a con! I'll talk about the wig in future progress reports. The SCA Iron Brigade demonstrating full contact dueling. There's an area set aside for fan based organizations, and there are a lot with tables and information. They vary from the Legion World (a fan group for the Legion of Superheroes), to Califur (the Southern California Furry Convention), the IKV Stranglehold (discussed later), and so many more. But the big draw for me is the live medieval combat demonstrations put on by the SCA Iron Brigade. It's one-on-one dueling, and looks great. You can feel the impact of a big ol' sword smacking onto a shield or armor helmet. 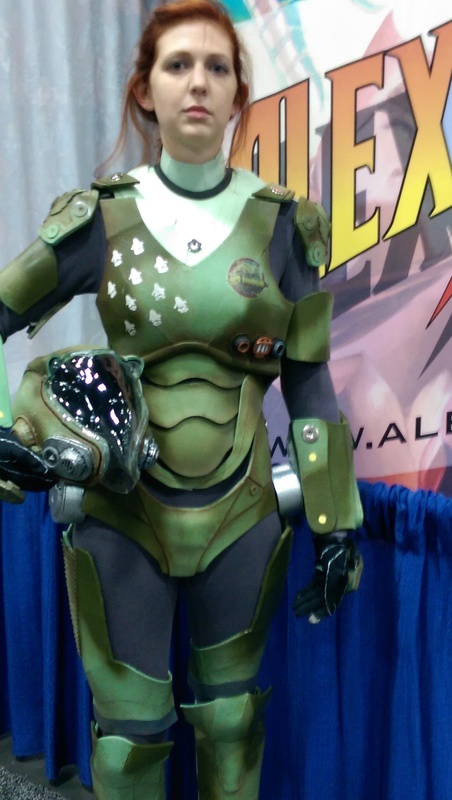 Full contact cosplay! There were several cosplay oriented panels, although the only one I made it to was about adding special effects to cosplay photos and videos. Cosplay Dreams 3D is a pretty cool documentary that's a real love fest for cosplayers. 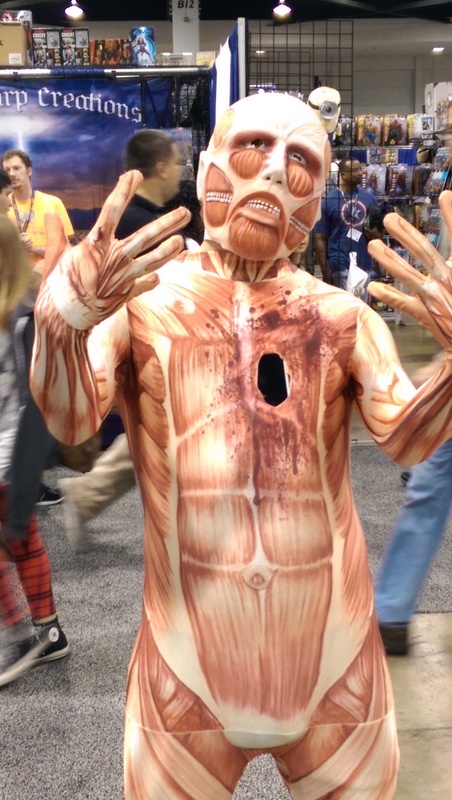 But in addition to talking with cosplayers, they took video in 3D of the cosplayers at conventions, and then added a variety of special effects. This made the footage into something magical! It was delightful to see these cosplayers, at conventions I know, suddenly have their character's special abilities come to life. I recommend seeing the clips on their website, or at any convention you can find them. Seeing what they were able to do was fantastic. I'm not sure I'm ready to dive in and spend the time they do, but I was inspired! One of the many cosplay skits at the 40th annual Comic-Con Masquerade. Technically, the Masquerade is also a panel, but it's an event all to itself. 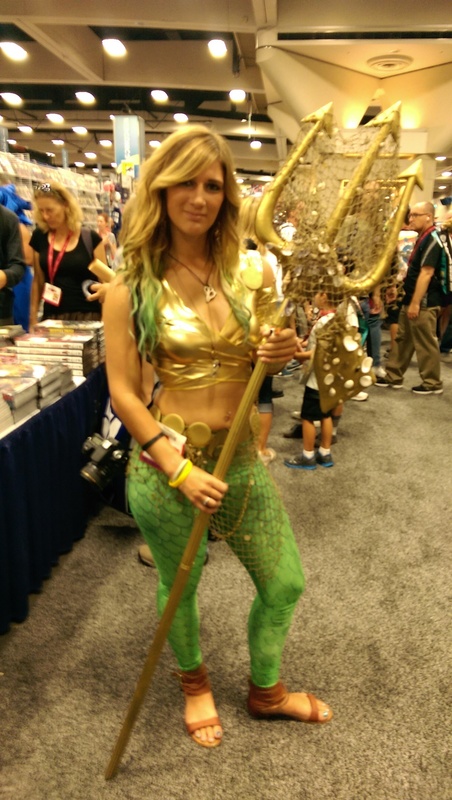 It's the cosplay contest at Comic-Con, and this year is its 40th anniversary. The event takes over Hall 20, the second largest room in the convention center and seats 4,000 people. But it's also simulcast to two other large conference rooms and to the Sails Pavilion, a large open area on the upper floor which was also catered with free food. That brings the size of the live audience to over 6000! The Masquerade is a major celebration at Comic-Con and as I understand it (I've never been directly involved with the competition) competitors pretty much have to plan on spending the day getting applications, dealing with judging, and whatever pre-show engineering and production needs to happen (and of course, all the associated Line-Cons). It's hosted by Kaja and Phil Foglio, the geniuses behind the Girl Genius franchise. And they are delightful at MC duties. The top competitors are more than static presenters since full skits almost seem to be required nowadays. My personal favorites were the pieces that addressed the multiplicity of fan universes. One performer went through a series of fandom costumes (Star Wars, Harry Potter, Firefly, etc), tearing away one costume to reveal another underneath. Wonderful! The other was a group piece that introduced one skeptic to all the different fandoms (by song! ), dressing him in one iconic article of clothing after another until he ended up with a conglomeration of pieces that was chaotic, yet recognizable. Brilliant! 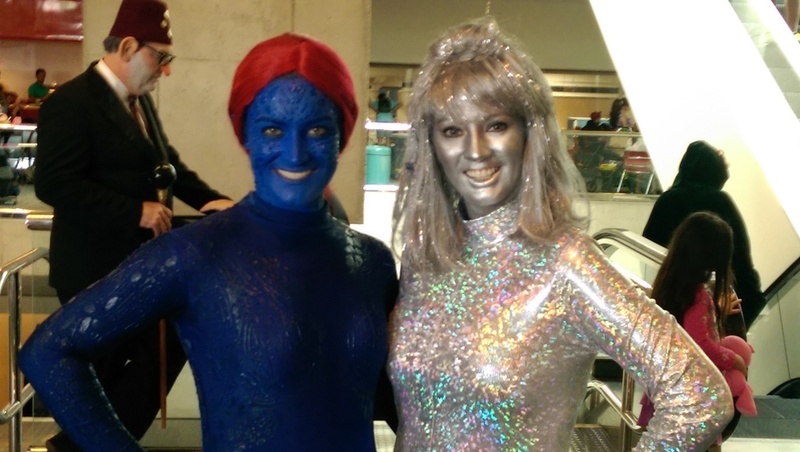 However, the winning piece was a group of women who had costumes that were inspired by various Kaiju, and they catwalked across a stage that was made up of faux skyscraper silouettes. They could kick them over in a stylized rampage through the city. It was sort of a fashion show/monster movie mashup. A reasonable (although to my mind, uninspired) winner. The Saber Guild's show during the Masquerade's judging break. Between the contestant presentations and the awards ceremony, while the judges are making their decisions, the Saber Guild presents a light saber combat show. I've seen several of their presentations, and this was the best so far. And, because so much of the crowd leaves after the contestants have finished, I was able to move up very close to the stage. I love these guys and would dearly love to join this kind of performing troupe. It was the motivation for me to learn some theatrical fencing. Unfortunately, they're in Anaheim and that's just too far for me to join their practice sessions. As I mentioned before, I was really happy with the panels I saw and regret not taking the time to see more (minor regret, I don't really know what I'd cut out to make more time). Also, almost all of the pictures I took at the panels were terrible, so rather than subject you to all of those, I'll put up the only one I like and just resort to a brief description of the panels. I saw two psychology themed panels: the Psychology of Cult TV Shows and the Psychology of Star Trek vs. Star Wars. 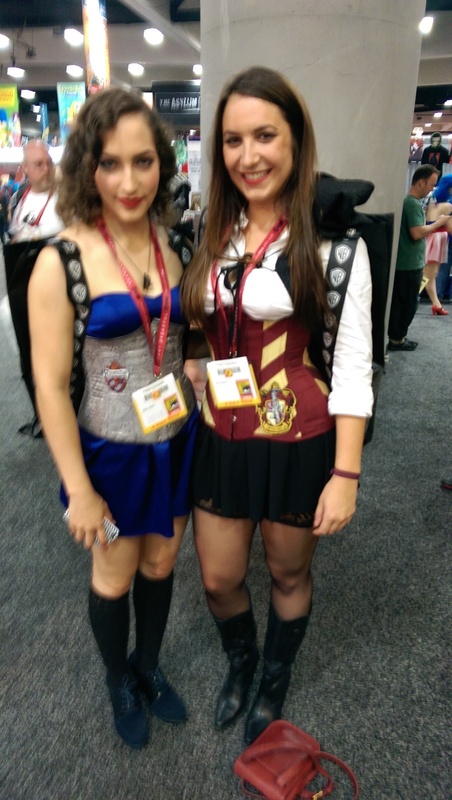 Both were amazing, and there's definitely a new geek trend (genre, clique, topic, hobby?) around psychological analysis of our geeky loves. I'll be talking about this in another post. Part of seeing those panels was getting a chance to meet my two favorite geek psychologists, Dr. Ali Matu and Dr. Andrea Letamendi. They both have podcasts that I listen to: Dr. Matu's Super Fantastic Nerd Hour and Dr. Letamendi's The Arkham Sessions. And that's what I mean, it's some sort of trend when I can have "favorite geek psychologists". I''l be talking a bit more about this later in this post. I attended two panels about women characters. 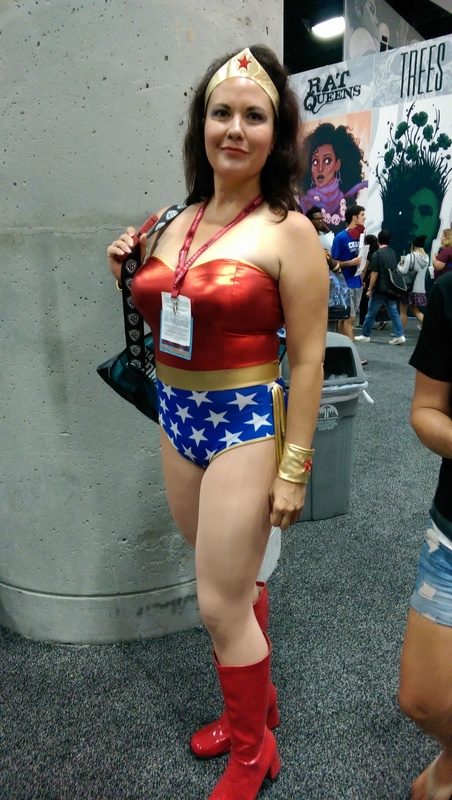 The first was called The Most Dangerous Women at Comic-Con, and the second was called Wonder Women of the 21st Century. 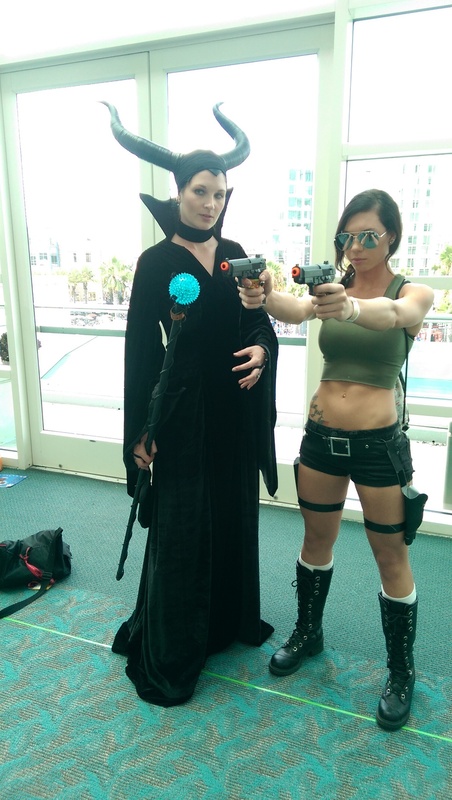 Both were terrific panels, but I have now become a big fan of Adrianne Curry who was on both panels. She's a model and reality TV personality, and has an amazing perspective on the industry and women and characters in addition to being a big ol' geek. 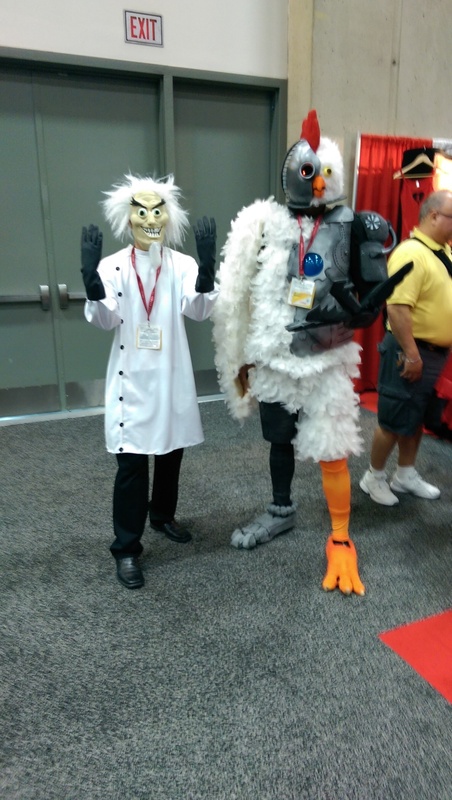 I also attended a panel about the new Thunderbirds reboot happening. Weta (the studio doing all the special effects in the Hobbit & Lord of the Rings movies) is producing for ITC a remake of the old Thunderbirds show. I loved that show as a kid and saw it when it first came to the US. Seeing what they are doing with miniature models and some of their test video has rekindled that same excitement I felt when I saw trailers for the J.J. Abrams Star Trek remake. I can't wait! David Peterson is the artist/writer behind the Mouse Guard franchise. It's really a beautiful series, and it's become popular enough to support a panel where he and his publisher discuss all the collectibles, games, and story lines coming up. The panel also included dramatic readings of three stories from a anthology of collected works by other creators in the Mouse Guard universe. It was very fun! My manga expertise is almost non-existent, so I decided to attend the Best & Worst Manga of 2014 panel to begin edumacating myself. Four writers who review manga each discussed their top choice in a variety of categories. Here's a link to their choices. It provided me with a pretty nice reading list. I also got a chance to meet the reviewers so I can pick out who to following in the future (I haven't decided yet - still reviewing their on-line stuff). Okay, I had to include one other photo from a session, and that's this shot from the Klingon Lifestyles event. 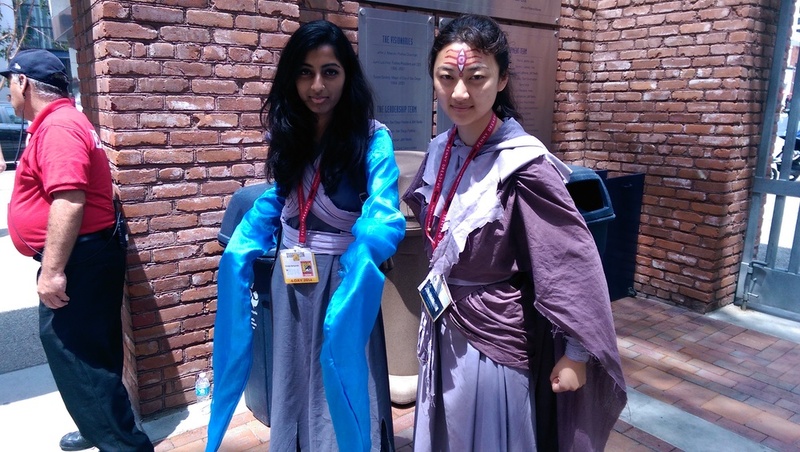 I mean, how could I not include a picture from a Klingon play? My favorite session by far is the Klingon Lifestyles event. This panel has been put on at Comic-Con for 21 years now, and in many ways it expresses the pure geeky fan loyalty that Comic-Con represents. A group of very amateur performers in full costume and makeup (although some of the prosthetics are almost intentionally applied poorly) regale the audience with a play that follows the antics of the IKV Stranglehold, a warship of the Klingon Empire. The piece is filled with puns, inside jokes, and asides to the audience. It is unadulterated fun, and the audience loves it. Shouts of Qapla' ring out to greet the players, and I think everyone leaves with a smile on their face. Some of the panels I discussed in other section : the cosplay special effects panel, the Masquerade, and the Eisner Awards. This is just a representative sample of the stuff I brought back. Statues, plushies, models, key chains, reproductions, lightsaber, cards, games, and yup, that's a water bottle. Yeah, this is when I realize I have some sort of problem. I came back with way too many toys and things. Action figures, statues, keychains (I don't use keychains), shirts, car floor mats (that's new! ), reproductions (a phaser, starfleet academy ring, and gold coins from Smaug's hoard! ), knitting kits (okay, those are gifts), a steampunk light saber, and on and on. There's less stuff than last year, but I don't even include the comics & artwork when I talk about this category. 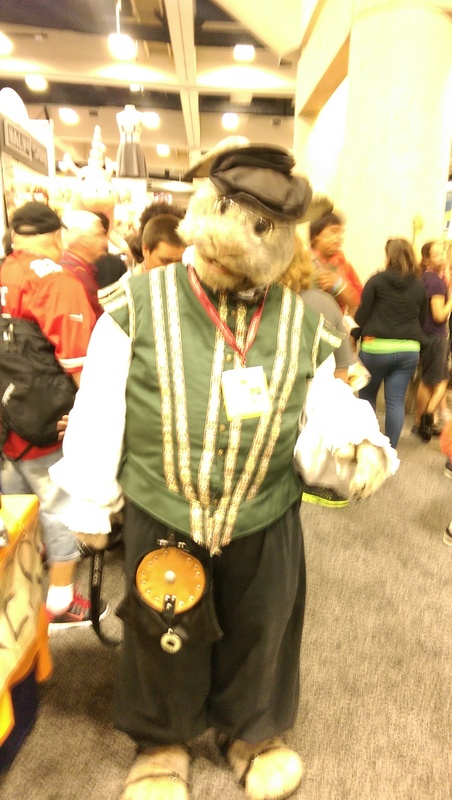 Still, this is one of the amazing things that Comic-Con provides. Unique items that celebrate the characters, stories, worlds, and genres that we love as geeks. I don't really regret any of it. I attended my first Nerd HQ event and I really enjoyed what that crew has put together. I attended a Conversation for a Cause with Nathan Fillion, and the venue was very well organized, the theater was very intimate with the speaker, and the staff and volunteers were delightful. There's a lot more available in the main hall for the casual visitor, so I'm definitely spending more time here next year. Nathan Fillion and Alan Tudyk at Nerd HQ's Conversation for a Cause. Nathan Fillion is as delightful as I've always heard. He's personable, funny, very engaging with his fans, and seems well liked by his co-workers. For his talk, he brought Alan Tudyk on stage with him, and the two have a remarkable chemistry. This was one of my highlights. Another highlight was spending some time chatting with Dr. Ali Matu. As I mentioned in the panels section, I fist saw him at a Psychology of Star Trek vs. Star Wars panel at WonderCon, and then subscribed to his podcast Super Fantastic Nerd Hour. Before one of his panels at Comic-Con, I saw him waiting and walked up to tell him how much I enjoyed the show. We ended chatting about several things, and geeking out together on a couple of topics. 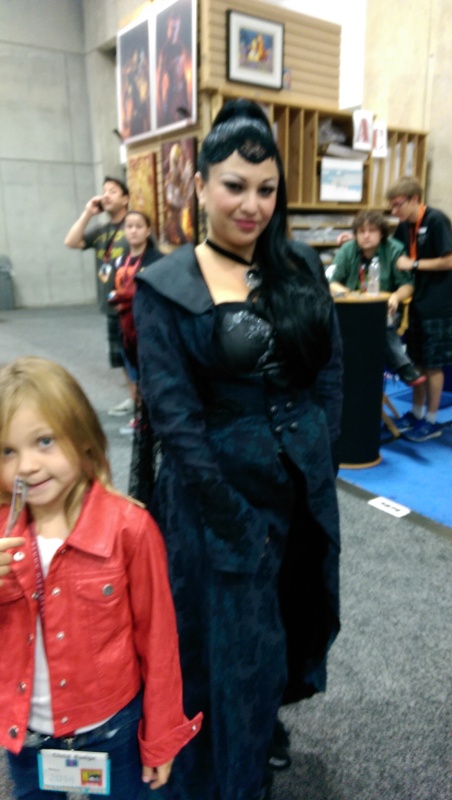 The whole interaction was delightful and stands out as one of my best moments at Comic-Con. Finally, my trip to San Diego every year is typically a very solo event. I rarely see friends there, and Harriet has no interest in attending the event (she's supportive, but not self-sacrificing). This year, however, I saw my niece who recently got married and moved to the area, and I reconnected with an old high school friend I hadn't seen in 35 years. Although not part of the geek mecca, they were highlights of my trip. It's time to try and reproduce that face with makeup. Darth Malgus' face reflects his violent life. You can see the throbbing veins on his head through his pasty white skin. There are large areas of scaring and deep wrinkles, and his eyes are shaded and glowing yellow. For all the times I've played Malgus, I have never tried to put on makeup in order to more closely match his face. Frankly, I have never put on makeup. Well, I may have worn makeup in the high school plays, but I'm sure I didn't put it on and I don't remember a thing about that. So, makeup is a huge barrier for me. And it's a barrier I need to break down. Tonight I made my first pass at putting on Malgus makeup. This is NOT a tutorial. I'm just trying to record my attempts at makeup so that I can observe my progress and maybe get some feedback. The items in the skeleton makeup kit along with the collodion I bought separately for creating scar effects. Since I have never done makeup, I don't have any of the stuff. Harriet very infrequently puts on makeup and isn't a big help. So I did what I often do when starting a new hobby, buy a kit that has all the tools and ingredients I need to get started along with instructions. Later I can buy the specific things I need more of, or find alternatives for the things I don't like. I know Mehron is one of the major makeup suppliers for theater and film. So I bought a kit they make for people doing skeleton makeup. The skeleton effect closely matches the white, lined face I need for Malgus. I also bought a bottle of collodion for creating scar effects. You can just make out the cheek scars I created, although in real life they stand out more. The scars and wrinkles show up well, and my eyebrow and beard are less noticeable behind the breather. I'm pretty pleased with my results. These pictures I took using the bathroom mirror are really poor and don't capture the detail of the makeup work. It took me a few tries, and I only worked on part of my forehead, one eye, and the one cheek. But that was enough to learn the scarring technique and how to deepen existing wrinkles as well as add some new ones. I'm also able to cover over my eyebrows and beard so they don't stand out as much. Now that I've used the kit, I realize I need a better container for the cover up powder and a few more application sponges as well as makeup remover wipes. I should have plenty of everything else. Guess I'll be making my first trip to a makeup counter. I do have contact lenses for making my eyes glow, but frankly, I'm a bit afraid to use them. I don't wear contacts, so that would be my first challenge, and the two host over at Cospod (which i listen to regularly) scared me with tales of eye cooties and blindness (thanks a lot Val and Amber!) I'll look at adding contact lenses to my costume next year. 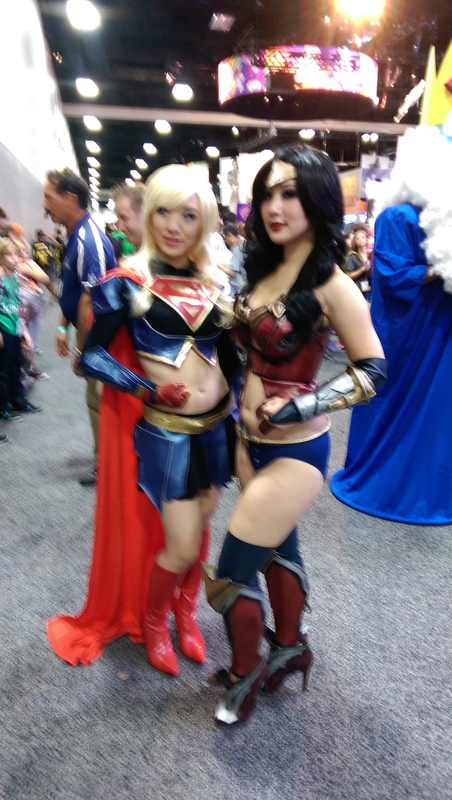 WonderCon was fantastic this year. 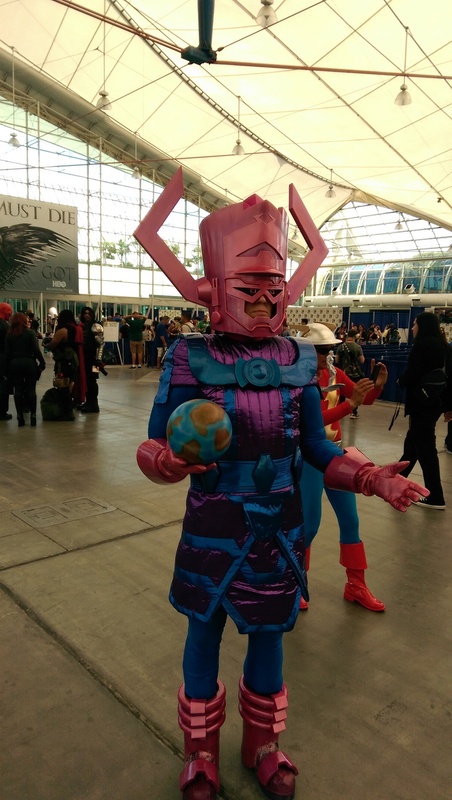 It's a smaller version of the San Diego Comic-Con, with comic publishers, artists and writers, TV and movie previews, cosplayers, sessions covering all sorts of geek culture, and a festival feel that only a large group of fanatics can bring to an event. And with only 50,000 or so attendees (compared to San Diego's 135,000) it is much more relaxed and accessible. Have I mentioned how much I loved this event. This post is going to be a quick overview of the event. In later posts I'll go into more detail on specific geek topics. If you can get to a con early and register, by all means do so! I drove down to Anaheim on Thursday and was able to pick up my 3-day pass with no line at all. Friday was the first day of the con, and I got in line an hour and a half before opening. That's plenty of time for WonderCon, putting me towards the front of the line. The main reason to be in line early is for the quick-to-sell-out convention exclusives. As often happens, they let the line in 1/2 hour early (compared to the published start times), and that happened all 3 days of the convention. I didn't do the line on Saturday and Sunday, because I was able to get the exclusives I was after on the first day. I just walked onto the exhibit floor about 15 minutes after the waiting lines were let in, and that was still about 15 minutes before the published start time. Did i mention how much I love this con? This year I planned on spending more time at the programmed sessions, hearing presentations from various comics publishers and creators about their plans for the year. Also, there would be some instructional sessions, and some presentations from TV and movie studios about their upcoming features. I had mixed results, probably attending more than usual, but a lot fewer than I had planned. It's at these sessions that I usually discover new geek sub-cultures. This time I discovered the Carol Corps, and it's a group I enthusiastically joined and will support. They are fans of the character Carol Danvers and her current superhero identity Captain Marvel (her overall history is a bit complicated). I was really impressed with the group's values (a distinctly feminist bend) and how they interacted. I also discovered Kelly Sue DeConnick, the writer of the character's current incarnation, whom I now adore and will read anything she writes. I think this was my overall find of the convention, and I'll write more about it all in a future post. Another fantastic panel was titled Psychology of Star Trek vs. Star Wars. A pair of geeky psychologists (Dr. Ali Mattu and Dr. Andrea Letamendi) were joined by an actor from the Star Trek franchise (Chase Masterson) and a voice actor from Star Wars: The Clone Wars (Catherine Taber) in a fantastic discussion of relationships as portrayed in the two franchises. Rather than try and summarize the panel, I'll direct you to a pretty good recap of the session. Overall, the discussion was so good that I've now subscribed to the two Dr.s nerd related podcasts and I'll write more about them later. The last of the really good panels (I attended others that were not so good) was called Batgirl Begins Again. The panelists were Gail Simone (the current writer of the Batgirl comic), Dr. Adrea Letamendi (yes, the same one who appeared in the previously discussed panel), and Dr. Travis Langley. 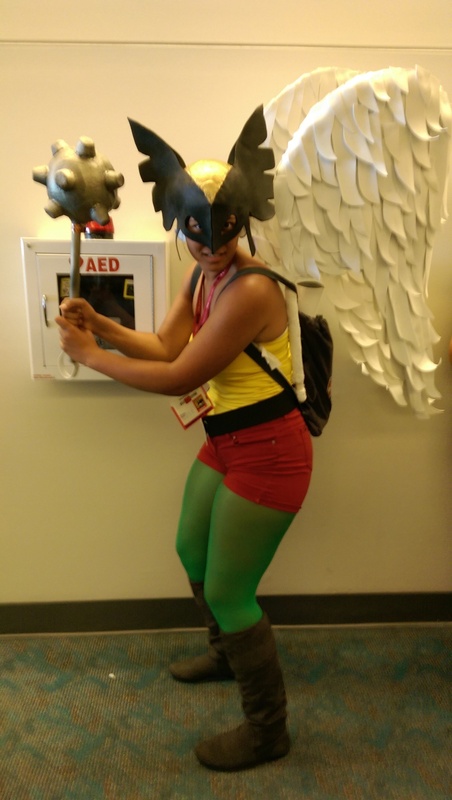 They had a fantastic discussion of the portrayal of the Barbara Gordon character through the trauma of being shot & paralyzed by the Joker (and how she was used as nothing more than a plot device), through the character's transformation into the wheel chair bound hero Oracle, and the current transformation back to a recovered Batgirl. Fascinating, fascinating, stuff, and just reinforced my crush on Dr. Letamendi. The only 'must have' collectible I had on my list going into the convention was the official shirt, which had a color illustration of Wonder Woman by Cliff Chiang. As I mentioned, on Friday I got into line early, and we were allowed onto the exhibit floor a half hour before the official opening time. I got into the Graphitti Designs line early and only had a 5 minute wait to get that shirt (and a few others). By the time I finished my transaction, it looked liked the line snaked down the convention floor. It pays to get in line early. This year, I picked up a couple of the Pop Vinyl figures from Funko. 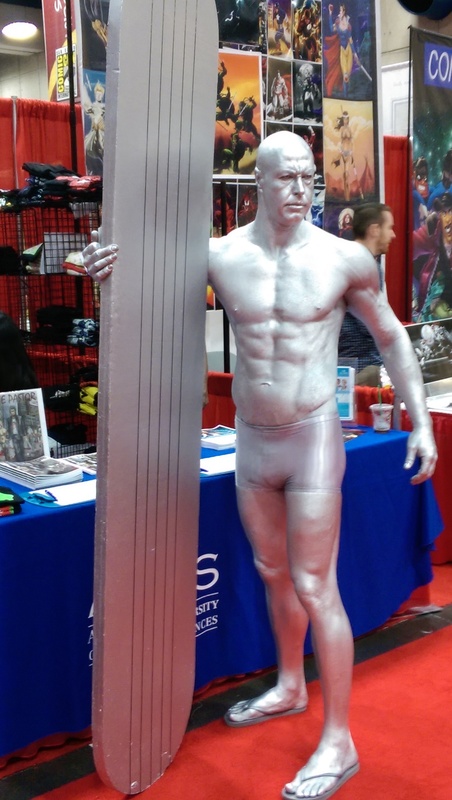 I had seen them around the cons before, but when I was buying some comics, I saw an Andorian figure from Star Trek. An Andorian is on my cosplay TODO list, so I looked it over, and it really grabbed me. And at $10 it's an easy impulse buy. Later I saw a Klingon figure in the series and bought it. I figured I'd get a Vulcan to complete my set, and of course spent the rest of the con fruitlessly looking through every vendor's booth. There are HUNDREDS of these figures from every pop culture franchise, and so now I'm hooked. Finally, I picked up a Darth Malgus figure (once again, my cosplay impacts my collecting) and a Wonder Woman statuette (okay, I have NO cosplay plans for this character, I'm just a fan of Wonder Woman). As discussed in previous posts, I brought my Darth Malgus and Headless Horseman costumes. On Friday I took a couple of hours to be Darth Malgus, and I had a fantastic time! The crowds were great and very appreciative. 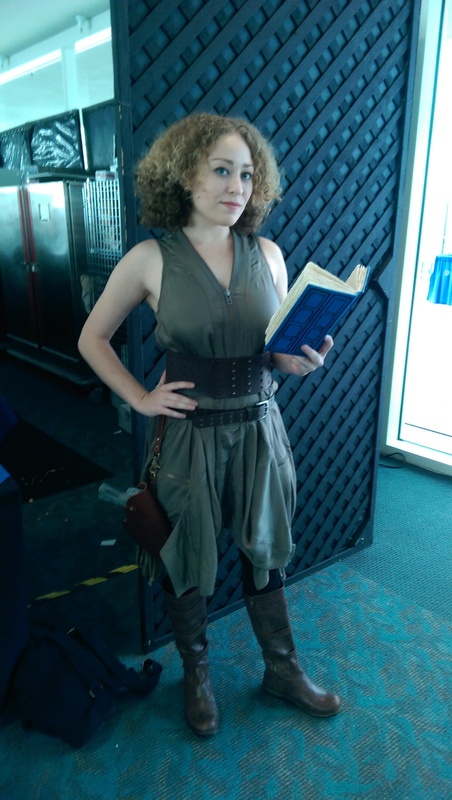 I had forgotten how much fun the cosplay is, and at WonderCon, it was even more enjoyable. 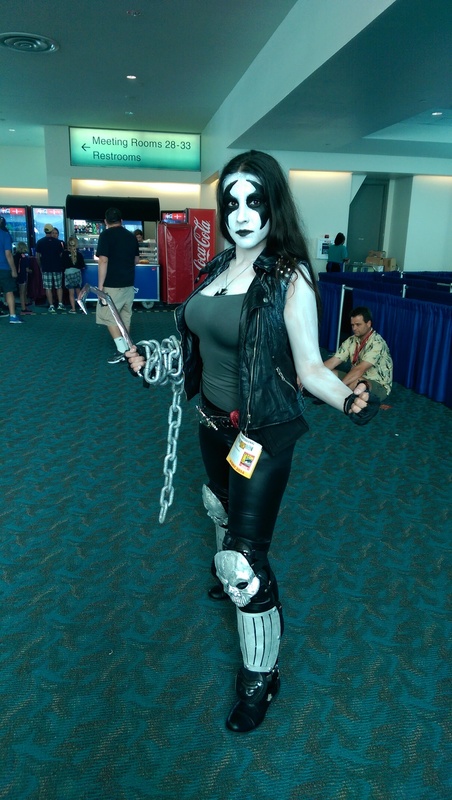 There were a lot of other cosplayers, but even so, it's not anywhere near as many as at Comic-Con, and so the cosplayers seem to stand out more. 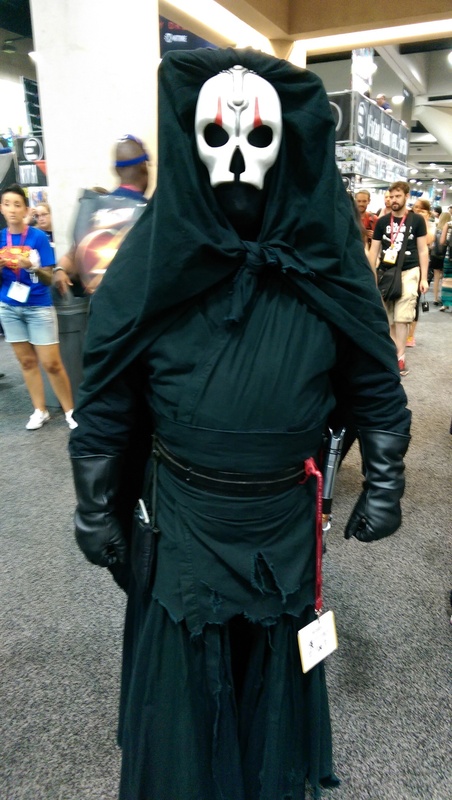 For instance, there were no other Darth Malgus cosplayers. And on Saturday, when I was the Headless Horseman, the crowds went nuts because there was nothing like him at the con. One of the difficulties I have with my cosplay is that I can't easily take selfies. So all the pictures posted of me were found on the net, posted by other photographers. 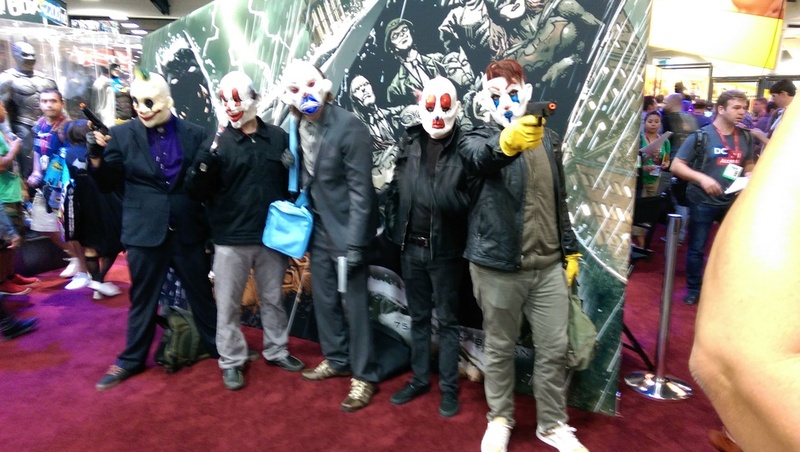 There were a lot of other, fantastic cosplays at the convention, and here's a gallery of the pictures I took. There were so many more, and it looked like everyone was having a great time, both inside and out of costume. And the couple of program sessions that were full (and I couldn't get into them) were both cosplay related. The masquerade, here showing the Nerds Who Say Ni. On Saturday night was one of my favorite events, the Masquerade. This cosplay competition takes place in the arena, the big sports center that houses the large WonderCon events like movie previews. There's plenty of room, so I arrived just as it started. You can see from the picture that there's a giant screen presenting whatever is happening on the stage, so no matter where you sit you get a pretty good show. Although I love watching people present their costumes and see the performances, I have no interest in competing myself. I am amazed by the detail of the work, and the fun (well, some of them anyway) performances. I couldn't even tell you who won what awards, so I'll just direct you to a better geek journalist who covered the event. Two members of Saber Guild performing while the judges deliberated. After the costume presentations, while the judges were deliberating, we were treated to a show by Saber Guild, a star wars themed theatrical combat troupe that uses light sabers. I would join that group in an instant if they were closer to Santa Barbara, but they're centered in Anaheim. For now I'll just enjoy watching their performances. Although I've put it at the end of the review, comics are the heart of this event. There are publishers, writers, artists, and retail vendors. And really, all the other geek activities I've discussed revolve around comics. I bought a few recent trades paperbacks, including some of the Valliant titles. I also picked up a few older trades that I collect (Legion of Super Heroes) or which I've loaned out never to see again (early Fables). This year I only picked up a couple of pieces of art, including a stunning poster of Wonder Woman by Paul Gulacy, a beautiful Star Wars piece, and a couple of silly cat heroes (the Avengers as cats). No original comic art this year. I'll wait until Comic-Con. And that's the brief recap. I'll be making more extensive posts on some of the topics introduced here. 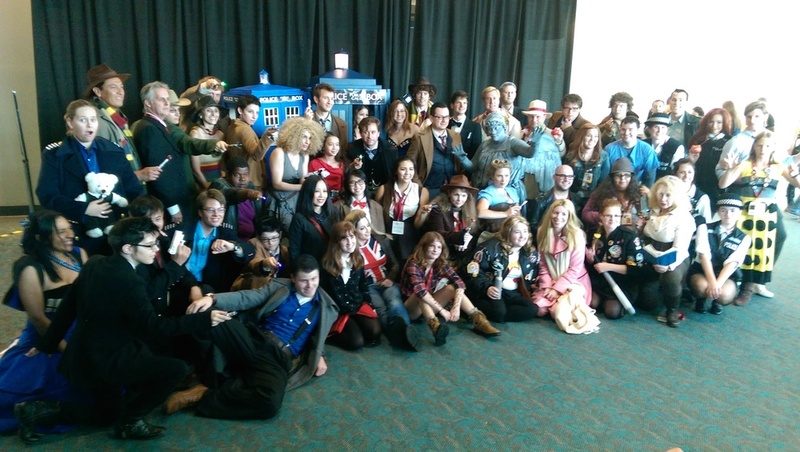 Overall, this was a very enjoyable convention, and a much more relaxed event than Comic-Con.